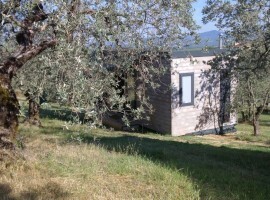 Glamping Villa Eleiva in Montecchio, a few miles from Orvieto, was set up by Chiara, Daniela, Massimo and Daniele. At the end of 2014 they were ready to turn their dream into a reality: to create an eco resort in the middle of an olive tree grove and produce their own oil. It may sound incredible but the olive groves that were once a lucrative business, cultivated on a large scale are just not thriving today: around 30% of olive plantations are abandoned by owners who simply can’t manage them and find them unproductive. 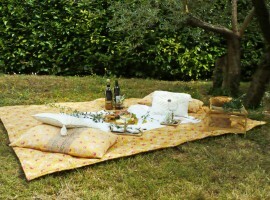 Daniela and Massimo decided to do something to change this: they started by renting Villa Eleiva and its land. Daniele and Chiara joined them a few months later. What else could they do to attract interest and get more exposure? 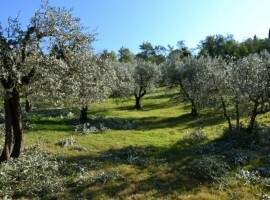 Bring people here and let them see for themselves the olive trees and the way of life that’s in danger. How? A new concept of hospitality- Glamping. 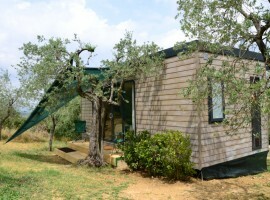 Glamping Villa Eleiva: never had chromotherapy in a olive tree wood? The word “glamping” comes from the combination of “glamour” and “camping” and refers to a new way of experiencing the outdoors: gone are those familiar muddy camp sites and here instead is the ultimate trend in eco hospitality where luxurious accommodation reigns supreme, with reduced environmental impact an added advantage. But describing the transport of their four lodges from north Italy, where they found a trusted provider, all the way to Umbria, as expensive and challenging is an understatement to say the least. And then they had to confront and overcome the risk of positioning the lodges amongst the olive trees without damaging them. But they did it- the first four lodges are now set in the middle of the wood and you can spot them through the silver green of the olive tree leaves. 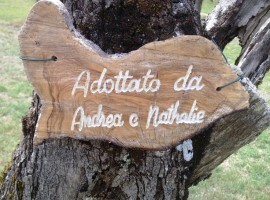 I slept like a baby in my lodge “Dolce Agogia”, named after one of the four local olive trees after having had a warm shower with some chromotherapy the night before. 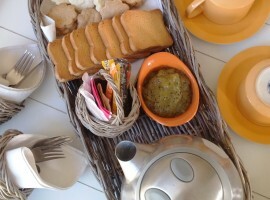 I woke up the following morning to find Massimo tiptoeing to my lodge holding a huge tray for breakfast: homemade kiwi marmalade, homemade biscuits with zesty limoncello and norcino, sweet liquor made out of lemons and nuts and a lemongrass infusion. I could have joined the other guests for breakfast on the terrace, overlooking the valley, but I admit the silence and colours of the olive tree wood bewitched me and kept me under their spell. I spent my breakfast daydreaming of having at least full two days to sit on the small patio outside the lodge, sipping hot green tea with fresh mint floating on top; each lodge has its own tiny private garden where rosemary, mint and other herbs and essences grow in season. 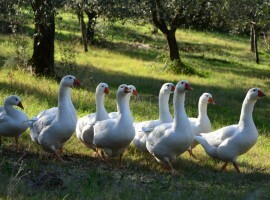 Let it be known that I’m against every kind of hunting, that is, except food hunting: jump on an electric car promoted by Green Card Umbria and let one of Villa Eleiva’s experts show you around the many “gems” of the area. Mondays are the ideal day to go to visit a goat farm. It’s run by a young couple who moved to the countryside a few years ago and their goats are raised in complete freedom, wandering around the property and eating the green. Extra treat: they listen to classical music and it seems like they just adore it. Can you imagine the scene-goats nibbling at the grass whilst Beethoven’s Ninth Symphony fills the air?! Worried your Tuesday won’t measure up against Monday’s music lover goats? Don’t panic: set off for Janas farm and meet Eleonora and learn how her childhood dream came true. When she was young, Eleonora’s father told her how he used to run through fields of black topped cereals. And this carefree image of being around nature stayed with the young daughter. So much so that today Eleonora and her husband manage a farm producing seven different types of organic durum wheat and three types of other more common organic wheat. “Each time I hear someone telling me about a cereal that has now completely disappeared I pray it’s not too late and I start tracking it down”. Her investigation usually means night after night surfing the web to find traces of the “missing seed” and lots of emails to agrarian universities and institutions around the world, attempting to start growing the forgotten seeds again. Listening to Eleonora’s tales soothes all your troubles away and teaches you about the power of dreams…and of not giving up. Lazy Wednesdays? Not at all. 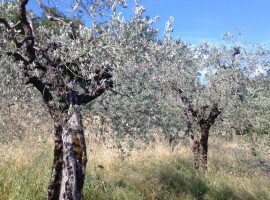 What about the olive trees? Villa Eleiva and its experts will teach you everything you need to know about these beautiful trees and their fruit. Did you know that different oils should be used with different dishes to help bring out the taste of ingredients? Learn all the right tips and be ready to impress your friends at home by offering the right oil for your meal. And what about Thursdays? The local “norcineria” awaits you. When in Umbria, remember that you don’t need to go to the butcher’s: you go and shop at a norcineria. Never heard of black truffles? That’s the star of Fridays at Glamping Villa Eleiva: a safari search for the black gem and a rush back to the local farm’s kitchen will help you learn all the tips and tricks to prepare a delicious risotto con tartufo. Can’t stay 5 days? No worries, as Glamping Villa Eleiva will adapt your experience for your stay. 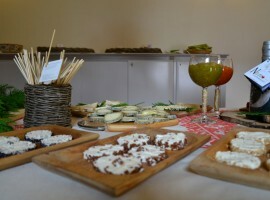 This entry was posted in go green, green hotels, travel stories and tagged eco hotels, food, local food, organic farm, organic food, Umbria. Bookmark the permalink.